Early finish today, I was just VERY tired and demoralised in the last session, and with my performance dropping off rapidly, I thought it best to stop early. 8.5 hours skiing and 9.5 hours out there. I'm not sure what happened but I hit a huge mental and physical wall about 3 hours before I had planned to stop for the day. The weather was amazing, clear blue sky. Very light SE wind, and really warm....coldest it got was -10C. So I can't blame the weather....oh maybe: It was so warm I didn't feel like eating fat foods, I almost had a craving for a coke and carbos! I never felt that in the Arctic, I was continously hungry....must be the temperature. I'm also drinkiing a lot, finishing my 2 litre flasks just over half way through the day, and that's after adding lots of snow and ice to my mug to make it more than 2 litres. Always keen to 'push the pace', I saw that the flatter surface would make it possiblle to glide ski, rather than walk ski, like I have been forced to do with my heavy sled. So I excitedly ripped off my ski skins (good for climbing and grip, but bad for glide) and now was ready to glide along and watch the miles really fly by! Well what a huge difference this made, I could actually ski for most if the time, but with a lot of effort. Well I couldn't resist, the glide skiing fellt so good I gave it a real shot. I estimate my speed increased 30% but it was tiring as I sennsed that while the surface was generally good, the effort to get me and my heavy sled gliding consumed me. It was such fun and the speed amazing thatt I was like a kid with a new racing bicycle. I think the 2hours of this just burnt me out, and I learn for the 100th time about me! Oh well early whisky cocktail tonight! Maybe I didn't deserve one, hey! Freedom in Antarctica, just me to set the rule! I do feel VERY exhausted, sore feet, and a litle sorry for myself! 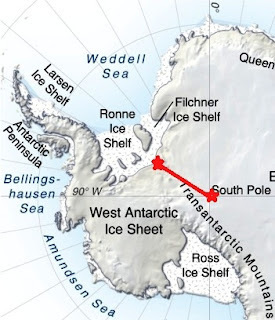 I guess tomorrow is another day, but I do need a new beacon strategy, and I can't wait for my sled to get lighter so I can effortlessly glide when tne terrain is right, and afterall it is a ski to the South Pole not a walk! Now the answer to the question of why I do such a horrendously thing like walking in nothingness on my own for 35+ days to get to the South Pole? I love exploring, and this is an extreme version of that. I have often quoted the book called The Ulysses Factor, The Human Need to Explore, and I found it rang so many chords for me, it helped me understand me. We all have a need to explore, some small amounts, others huge amounts, and and for the explorer, it's nnot enough to readd about exploration, they have to go and experience it, because it's not just about exploring the physical terrain, it's also about understanding what it REALLY feels like to do it, this is the real exploring. What I am experiencing now is priceless for me, as I'm experiencing what it REALLY takes to walk to the South Pole. Yes, with technology aand many before me it's not as severe as the early explorers, but it's close enough for my explorer need to be satisfied. 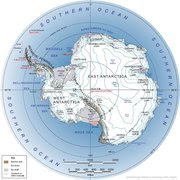 Clearly seeing first hand EXACTLY what Antarctica is all about is another huge explorer need being satisfied. The second reason is the male (?) competitive thing: Yes, I read about these expeditions and how difficult and demanding they are, and from witthin me comes this call to see how tough you really are and where you rank on the explorer / adventurer tougghness scale. When one reads about these extreme adventures, particularly these days, where drama and toughness are both exaggerated and valued, I want to find out for myself how difficult these things REALLY are, and also rank myself in the process. So there we go my answers. I hope you value my honesty, and don't see the second reason as egotistical, because it's n0t ment to be...The world is a competiive place, and we all fit in soomewhere! Ok, I'm ealy to bed tonight, I really need the body and mind rest break....! Pretty sure I'll wake with a body that was stiffness in new places, and a mind that has been restlessly rying to solve the no sastruggi beacon problem for tomorrow! I must make a 30+ kilometre day tomorrow as I cross the 83rd South parallel . When everything is the same, how do you stay alert? What keeps you from drifting inside of your head, losing awareness of surroundings and falling into a crevasse? Suppose great disappointment with the 9.5 hours.Don't mention distance covered but the glide skiing must have helped.There always seems to be a compromise,speed v energy.Interesting explanation! I was not surprised about your reasons for doing this; I still remember you always challenging the boundaries of what could be done and why; and then racing the rest of us with you to the goal you convinced us was almost right.